The School Library is one of the hallmarks of the school. The library houses a wide variety of books and journals. It serves as store house of information related, to prescribed text books and beyond. 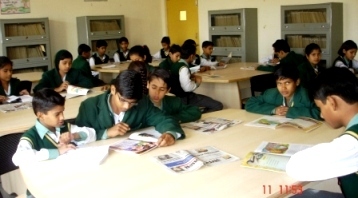 Its purpose is to inculcate reading habit amongst students. Renowned works of Fiction, Classics, Self Help Books, Science & Technology Periodicals, Journals related to history, culture, exploration along with selected local and national dailies will be housed here. All articles in the library will be carefully scanned and selected to ensure the correct development of the students.